CTW CHICK MAGNET, Birmingham, 05/30/2012, Afternoon, race 7 post #5. Result: 4-2-3- . DODGE CALIBER, Birmingham, 05/30/2012, Evening, race 10 post #2. Result: 1-4- - . DOUG'S FREIDA, Gulf Greyhound, 05/30/2012, Afternoon, race 2 post #8. Result: 2-8-6- . KIOWA VANESSA, Orange Park, 05/30/2012, Evening, race 7 post #4. Result: 3-2-4- . RK'S CONK GONK, Palm Beach, 05/30/2012, Afternoon, race 6 post #4. Result: 1-7-8- . JUST TERRIFIC, Palm Beach, 05/30/2012, Afternoon, race 12 post #2. Result: 5-3-2- . CUSTOM TRENT, Palm Beach, 05/30/2012, Afternoon, race 14 post #3. Result: 6-3-2- . MONKEYS UNCLE, Palm Beach, 05/30/2012, Afternoon, race 14 post #6. Result: 6-3-2- . VENUS ESPINOSA, Derby Lane, 05/30/2012, Afternoon, race 6 post #7. Result: 6-4-7- . GABLE GO SHAUNEE, Derby Lane, 05/30/2012, Afternoon, race 8 post #6. Result: 4-5-7- . BACKWOOD CODY, Derby Lane, 05/30/2012, Afternoon, race 10 post #5. Result: 1-5-2- . JUMP N JIVE, Bluffs Run, 05/31/2012, Afternoon, race 13, post #5. CRS SPIDER WEB, Palm Beach, 05/31/2012, Afternoon, race 10, post #1. BACS XTREME, Palm Beach, 05/31/2012, Afternoon, race 11, post #2. SAND CLOUD, Derby Lane, 05/31/2012, Evening, race 8, post #2. MANIC MAC ELROY, Tri-State, 05/31/2012, Evening, race 7, post #7. UMR HYDRO, Tri-State, 05/31/2012, Evening, race 11, post #2. MISSOURI MOMMA, Tucson, 05/31/2012, Evening, race 6, post #4. RAMS KIZZY KATE, Tucson, 05/31/2012, Evening, race 9, post #1. ﻿ Returning to the Greyhound of the Week honoree list for the second time in 2012, Riley Jaymes of Libby Racing Kennels put together two fantastic efforts this week to punch his ticket into this week’s spotlight. The 81-pound brindle male bred from Dominator -Struttin Carly and owned by Russ Mc Elhinny has experienced a long, successful career on the Texas Gulf Coast with a record of 138/37-19-15-13 over a two-year span. A one-time competitor for the departed LQK Kennels, Inc., the familiar figure of trainer Cam Hawkins moved along with Riley Jaymes to run for Libby Racing Kennels. Since winning back-to-back grade AA races in late January of 2012 to earn the weekly honors for the first time, Riley Jaymes has remained in the Gulf’s top two grades of A and AA with a versatile running style of closing from the middle of the pack or occasionally rushing to the early lead. Gulf Greyhound Park’s leading kennel in 2012, K-Rod Kennel trained by Cindy Unrein, solidified their grip on top of the kennel standings with an impressive week of racing. With 63 starts, the troops had an eye popping 18 wins, 5 seconds, 8 thirds and 5 fourth place finishes earning $9,840.42 in purse money. Leading the way were top grade winners KB’s Jacinto, Ruff Country and SS Stem Winder. This latest effort by the K-Rod bunch doubled the margin from 8 wins to 16 wins over second D.Q. Williams Kennel. COACH PRINCESS, Birmingham, 05/29/2012, Evening, race 4 post #3. Result: 3-7-4- . LAVA MATSUI, Birmingham, 05/29/2012, Evening, race 4 post #8. Result: 3-7-4- . JET FORCE, Bluffs Run, 05/29/2012, Afternoon, race 6 post #1. Result: 1-7-6- . MC FULL MOON, Bluffs Run, 05/29/2012, Afternoon, race 8 post #1. Result: 1-2-8- . AMF SULTANA, Palm Beach, 05/29/2012, Afternoon, race 15 post #2. Result: 2-8-1- . JW TITLEIST, Derby Lane, 05/29/2012, Evening, race 10 post #1. Result: 7-6-4- . GAME PLANE, Tucson, 05/29/2012, Evening, race 13 post #4. Result: 4-6-8- . CTW CHICK MAGNET, Birmingham, 05/30/2012, Afternoon, race 7, post #5. DODGE CALIBER, Birmingham, 05/30/2012, Evening, race 10, post #2. DOUG'S FREIDA, Gulf Greyhound, 05/30/2012, Afternoon, race 2, post #8. KIOWA VANESSA, Orange Park, 05/30/2012, Evening, race 7, post #4. RK'S CONK GONK, Palm Beach, 05/30/2012, Afternoon, race 6, post #4. JUST TERRIFIC, Palm Beach, 05/30/2012, Afternoon, race 12, post #2. CUSTOM TRENT, Palm Beach, 05/30/2012, Afternoon, race 14, post #3. MONKEYS UNCLE, Palm Beach, 05/30/2012, Afternoon, race 14, post #6. VENUS ESPINOSA, Derby Lane, 05/30/2012, Afternoon, race 6, post #7. GABLE GO SHAUNEE, Derby Lane, 05/30/2012, Afternoon, race 8, post #6. BACKWOOD CODY, Derby Lane, 05/30/2012, Afternoon, race 10, post #5. DODGE CALIBER, Birmingham, 05/28/2012, Afternoon, race 8 post #2. Result: 7-2-6- . DLT EXTRACTOR, Gulf Greyhound, 05/28/2012, Afternoon, race 1 post #6. Result: 5-1-6- . WP'S CLINTON, Orange Park, 05/28/2012, Afternoon, race 10 post #6. Result: 7-1-3- . UHAUL MUFFIN, Palm Beach, 05/28/2012, Afternoon, race 10 post #8. Result: 6-7-4- . BELLA DA BULL, Southland, 05/28/2012, Afternoon, race 11 post #6. Result: 2-4-3- . BELLA INFRARED, Southland, 05/28/2012, Afternoon, race 17 post #2. Result: 2-8-4- . CRAIGIE I AM JAK, Derby Lane, 05/28/2012, Afternoon, race 14 post #6. Result: 8-5-7- . MANI STRONG, Tri-State, 05/28/2012, Evening, race 15 post #4. Result: 1-2-4- . COACH PRINCESS, Birmingham, 05/29/2012, Evening, race 4, post #3. LAVA MATSUI, Birmingham, 05/29/2012, Evening, race 4, post #8. JET FORCE, Bluffs Run, 05/29/2012, Afternoon, race 6, post #1. MC FULL MOON, Bluffs Run, 05/29/2012, Afternoon, race 8, post #1. AMF SULTANA, Palm Beach, 05/29/2012, Afternoon, race 15, post #2. JW TITLEIST, Derby Lane, 05/29/2012, Evening, race 10, post #1. GAME PLANE, Tucson, 05/29/2012, Evening, race 13, post #4. DODGE CALIBER, Birmingham, 05/26/2012, Afternoon, race 4 post #1. Result: 7-8-6- . COACH PRINCESS, Birmingham, 05/26/2012, Afternoon, race 8 post #5. Result: 1-5-8- . LAVA MATSUI, Birmingham, 05/26/2012, Afternoon, race 12 post #6. Result: 1-5-7- . CTW CHICK MAGNET, Birmingham, 05/26/2012, Evening, race 14 post #6. Result: 6-7-4- . WW'S GUCCI, Orange Park, 05/26/2012, Evening, race 9 post #4. Result: 1-4-8- . KIOWA VANESSA, Orange Park, 05/26/2012, Evening, race 11 post #1. Result: 7-4-1- . MAGIC TEMPURA, Orange Park, 05/26/2012, Evening, race 14 post #6. Result: 3-5-8- . STARZ EQUALMIST, Palm Beach, 05/26/2012, Afternoon, race 6 post #8. Result: 1-6-5- . BOC'S DOUBLEDOSE, Dubuque, 05/27/2012, Afternoon, race 9, post #3. COUSIN KIM, Ebro, 05/27/2012, Evening, race 5, post #4. SNEAKY PEEKY, Ebro, 05/27/2012, T, race 6, post #6. MAGIC TORPEDO, Tri-State, 05/27/2012, Evening, race 12, post #5. SLATEX EMERALD, Bluffs Run, 05/25/2012, Afternoon, race 11 post #2. Result: 6-1-7- . TWISTING TWISTER, Bluffs Run, 05/25/2012, Afternoon, race 11 post #8. Result: 6-1-7- . DLT EXTRACTOR, Gulf Greyhound, 05/25/2012, Evening, race 2 post #2. Result: 3-8-1- . DOUG'S FREIDA, Gulf Greyhound, 05/25/2012, Evening, race 13 post #8. Result: 2-5-1- . CUSTOM TRENT, Palm Beach, 05/25/2012, Afternoon, race 6 post #7. Result: 7-1-6- . MONKEYS UNCLE, Palm Beach, 05/25/2012, Afternoon, race 15 post #6. Result: 1-8-4- . KCK CANDIBAR, Palm Beach, 05/25/2012, Evening, race 4 post #7. Result: 3-5-4- . CRS SPIDER WEB, Palm Beach, 05/25/2012, Evening, race 5 post #6. Result: 6-8-1- . DODGE CALIBER, Birmingham, 05/26/2012, Afternoon, race 4, post #1. COACH PRINCESS, Birmingham, 05/26/2012, Afternoon, race 8, post #5. LAVA MATSUI, Birmingham, 05/26/2012, Afternoon, race 12, post #6. CTW CHICK MAGNET, Birmingham, 05/26/2012, Evening, race 14, post #6. WW'S GUCCI, Orange Park, 05/26/2012, Evening, race 9, post #4. KIOWA VANESSA, Orange Park, 05/26/2012, Evening, race 11, post #1. MAGIC TEMPURA, Orange Park, 05/26/2012, Evening, race 14, post #6. STARZ EQUALMIST, Palm Beach, 05/26/2012, Afternoon, race 6, post #8. SLATEX TOPAZ, Bluffs Run, 05/24/2012, Afternoon, race 10 post #2. Result: 5-7-8- . JET FORCE, Bluffs Run, 05/24/2012, Afternoon, race 11 post #7. Result: 7-5-6- . MC FULL MOON, Bluffs Run, 05/24/2012, Afternoon, race 11 post #2. Result: 7-5-6- . WP'S CLINTON, Orange Park, 05/24/2012, Evening, race 11 post #6. Result: 2-1-7- . RK'S CONK GONK, Palm Beach, 05/24/2012, Afternoon, race 10 post #4. Result: 4-7-6- . JW TITLEIST, Derby Lane, 05/24/2012, Evening, race 6 post #5. Result: 2-1-5- . SLATEX EMERALD, Bluffs Run, 05/25/2012, Afternoon, race 11, post #2. TWISTING TWISTER, Bluffs Run, 05/25/2012, Afternoon, race 11, post #8. DLT EXTRACTOR, Gulf Greyhound, 05/25/2012, Evening, race 2, post #2. DOUG'S FREIDA, Gulf Greyhound, 05/25/2012, Evening, race 13, post #8. CUSTOM TRENT, Palm Beach, 05/25/2012, Afternoon, race 6, post #7. MONKEYS UNCLE, Palm Beach, 05/25/2012, Afternoon, race 15, post #6. KCK CANDIBAR, Palm Beach, 05/25/2012, Evening, race 4, post #7. CRS SPIDER WEB, Palm Beach, 05/25/2012, Evening, race 5, post #6. LAVA MATSUI, Birmingham, 05/23/2012, Evening, race 4 post #2. Result: 3-6-2- . COACH PRINCESS, Birmingham, 05/23/2012, Evening, race 6 post #1. Result: 1-6-8- . CTW CHICK MAGNET, Birmingham, 05/23/2012, Evening, race 11 post #1. Result: 7-4-2- . SNEAKY PEEKY, Ebro, 05/23/2012, Evening, race 4 post #2. COUSIN KIM, Ebro, 05/23/2012, Evening, race 8 post #6. KIOWA VANESSA, Orange Park, 05/23/2012, Evening, race 7 post #6. Result: 8-6-3- . AMF SULTANA, Palm Beach, 05/23/2012, Afternoon, race 15 post #3. Result: 6-4-1- . SLATEX TOPAZ, Bluffs Run, 05/24/2012, Afternoon, race 10, post #2. JET FORCE, Bluffs Run, 05/24/2012, Afternoon, race 11, post #7. MC FULL MOON, Bluffs Run, 05/24/2012, Afternoon, race 11, post #2. WP'S CLINTON, Orange Park, 05/24/2012, Evening, race 11, post #6. RK'S CONK GONK, Palm Beach, 05/24/2012, Afternoon, race 10, post #4. JW TITLEIST, Derby Lane, 05/24/2012, Evening, race 6, post #5. KCK CANDIBAR, Palm Beach, 05/22/2012, Afternoon, race 4 post #6. Result: 6-5-1- . BACS XTREME, Palm Beach, 05/22/2012, Afternoon, race 11 post #1. Result: 5-1-6- . STARZ EQUALMIST, Palm Beach, 05/22/2012, Afternoon, race 15 post #8. Result: 7-6-1- . CRAIGIE I AM JAK, Derby Lane, 05/22/2012, Evening, race 4 post #1. Result: 8-1-2- . BACKWOOD CODY, Derby Lane, 05/22/2012, Evening, race 6 post #5. Result: 6-8-5- . GABLE EDDIE, Derby Lane, 05/22/2012, Evening, race 6 post #6. Result: 6-8-5- . VENUS ESPINOSA, Derby Lane, 05/22/2012, Evening, race 10 post #8. Result: 5-8-1- . RED PERSISTENCE, Tucson, 05/22/2012, Evening, race 7 post #8. Result: 4-3-2- . BELLA KAYAKER, Wheeling, 05/22/2012, Afternoon, race 14 post #8. Result: 3-1-2- . LAVA MATSUI, Birmingham, 05/23/2012, Evening, race 4, post #2. COACH PRINCESS, Birmingham, 05/23/2012, Evening, race 6, post #1. CTW CHICK MAGNET, Birmingham, 05/23/2012, Evening, race 11, post #1. SNEAKY PEEKY, Ebro, 05/23/2012, Evening, race 4, post #2. COUSIN KIM, Ebro, 05/23/2012, Evening, race 8, post #6. KIOWA VANESSA, Orange Park, 05/23/2012, Evening, race 7, post #6. AMF SULTANA, Palm Beach, 05/23/2012, Afternoon, race 15, post #3. MAGIC TORPEDO, Tri-State, 05/23/2012, Evening, race 12, post #7. MANI STRONG, Tri-State, 05/23/2012, Evening, race 12, post #4. RAMS KIZZY KATE, Tucson, 05/23/2012, Evening, race 9, post #1. Never having been to a Greyhound race or a racetrack gave me an edge and also a rather childish view of the events I was about to experience. I am a dog advocate, a retired Social Worker, and currently a media personality for a local Radio Station. I had met Mr. Johnny O’Donnell, an owner / Trainer with North Shore Kennel at Southland Park Gaming and Racing in West Memphis, AR through Vicki Cohen, Director of Mid South Greyhound Adoption Option. During our interview I was impressed with his knowledge and passion for his dogs as well as his honest and patient answers to my many questions. Like the majority of people in our communities I had heard the hushed whispers of atrocities rumored to be associated with Greyhounds in the racing industry. Many of these rumors I had dispelled due to a little common sense. It just didn’t add up that people would mistreat the very animals that supplied them with a livelihood. So when this very gracious and likable man offered to allow me to attend a morning training session to see for myself how the dogs were trained for running on the track I eagerly accepted. REMINDER!...PALM BEACH KENNEL CLUB PRESS CONFERENCE FOR FIRST-EVER $10k ROONEY'S OLD IRISH ALE CUP RACES THURSDAY, MAY 24! You are cordially invited to attend Palm Beach Kennel Club's Press Conference for our first-ever $10K Rooney’s Old Irish Ale Cup Races, a new and unique concept for exciting Greyhound racing! What makes the $10K Rooney’s Old Irish Ale Cup Races unique, is each of the track’s thirteen kennel will get an entry into one of the two Cup Races, each with an added purse of $5,000. Prior to the press conference, each kennel will select their own Greyhound they wish to compete, and then choose an alternate competitor, meaning three kennels will get an entry into both Cup Races. PALM BEACH KENNEL CLUB $10,000 ROONEY'S OLD IRISH ALE CUP RACES MONDAY AFTERNOON, MAY 28, MEMORIAL DAY! MEMORIAL DAY DEBUT OF THE $10,000 ROONEY’S OLD IRISH ALE CUP RACES MONDAY AFTERNOON, MAY 28! West Palm Beach, Fl. – A unique pair of races will be held Monday afternoon, May 28, Memorial Day, as Palm Beach Kennel Club presents the inaugural running of the $10,000 Rooney’s Old Irish Ale Cup races. Competing in each of the two $5,000 Cup races will be Greyhounds selected by the track’s kennels. Each of the 13 kennels is guaranteed an entry into one of the Cup races. Each kennel also selected an alternate Greyhound. Three of those lucky racers will fill the final three spots in the second Rooney’s Old Irish Ale Cup event. West Palm Beach, FL – Service Dogs 4 Service Men will formally present the first of their retired racing greyhound service dogs to a deserving veteran at a ceremony sponsored by the Palm Beach Kennel Club on Friday, May 25, pre-gathering at 10:30 am. This is the first of what will be many donations of these magnificent animals trained by this group of dedicated individuals. The three-way battle continues at the top of the kennel standings but this time D.Q. Williams Kennel earned the Kennel of the Week honors over K-Rod Kennel and Libby Racing Kennels. Trainer Craig Edwards led his troops to a week consisting of 11 wins, 7 seconds, 12 thirds and 8 fourth place finishes earning $8,685.10 in purse money. Greek Boymaurice was the only top grade winner for D.Q. Williams Kennel with a front running victory Saturday afternoon May 19. D.Q. Williams Kennel remains in second place of the 2012 kennel standings trailing by eight wins behind K-Rod Kennel. There is a quote, `good things come to those who wait`, that can be used for this week’s recipient of the Greyhound of the Week honors. During a span of 107 career starts on the Texas Gulf Coast over nearly two years, C Ya Big Shot of LaRosa Racing Kennel and owned by Darin Neal and Rodrick Neal, experienced his moment in the sun and accomplished something for the first time in his career, winning a top grade AA contest. The name of the game for C Ya Big Shot consists of his rail running style and closing ground from the back of the pack. After beginning his long journey in July of 2010, C Ya Big Shot slowly worked his way through the grade ladder trying both the 550 and 660-yard distances. In late April of 2011, C Ya Big Shot reached Gulf Greyhound Park’s top grade but experienced trouble over his next three races and the stay was cut short. KCK CANDIBAR, Palm Beach, 05/22/2012, Afternoon, race 4, post #6. BACS XTREME, Palm Beach, 05/22/2012, Afternoon, race 11, post #1. STARZ EQUALMIST, Palm Beach, 05/22/2012, Afternoon, race 15, post #8. CRAIGIE I AM JAK, Derby Lane, 05/22/2012, Evening, race 4, post #1. BACKWOOD CODY, Derby Lane, 05/22/2012, Evening, race 6, post #5. GABLE EDDIE, Derby Lane, 05/22/2012, Evening, race 6, post #6. VENUS ESPINOSA, Derby Lane, 05/22/2012, Evening, race 10, post #8. RED PERSISTENCE, Tucson, 05/22/2012, Evening, race 7, post #8. BELLA KAYAKER, Wheeling, 05/22/2012, Afternoon, race 14, post #8. COACH PRINCESS, Birmingham, 05/21/2012, Afternoon, race 4 post #5. Result: 7-5-4- . LAVA MATSUI, Birmingham, 05/21/2012, Afternoon, race 11 post #8. Result: 1-7-2- . CTW CHICK MAGNET, Birmingham, 05/21/2012, Afternoon, race 12 post #1. Result: 6-1-7- . WW'S GUCCI, Orange Park, 05/21/2012, Evening, race 14 post #1. Result: 4-3-1- . JUST TERRIFIC, Palm Beach, 05/21/2012, Afternoon, race 10 post #5. Result: 1-5-4- . CRS SPIDER WEB, Palm Beach, 05/21/2012, Afternoon, race 11 post #8. Result: 1-3-6- . KB'S HASLET, Palm Beach, 05/21/2012, Afternoon, race 12 post #5. Result: 4-6-7- . UHAUL MUFFIN, Palm Beach, 05/21/2012, Afternoon, race 12 post #1. Result: 4-6-7- . OUT D BOX, Tucson, 05/21/2012, Evening, race 6 post #4. Result: 6-8-7- . GAME PLANE, Tucson, 05/21/2012, Evening, race 13 post #7. Result: 3-1-5- . COACH PRINCESS, Birmingham, 05/21/2012, Afternoon, race 4, post #5. LAVA MATSUI, Birmingham, 05/21/2012, Afternoon, race 11, post #8. CTW CHICK MAGNET, Birmingham, 05/21/2012, Afternoon, race 12, post #1. WW'S GUCCI, Orange Park, 05/21/2012, Evening, race 14, post #1. JUST TERRIFIC, Palm Beach, 05/21/2012, Afternoon, race 10, post #5. CRS SPIDER WEB, Palm Beach, 05/21/2012, Afternoon, race 11, post #8. KB'S HASLET, Palm Beach, 05/21/2012, Afternoon, race 12, post #5. UHAUL MUFFIN, Palm Beach, 05/21/2012, Afternoon, race 12, post #1. OUT D BOX, Tucson, 05/21/2012, Evening, race 6, post #4. GAME PLANE, Tucson, 05/21/2012, Evening, race 13, post #7. JUMP N JIVE, Bluffs Run, 05/20/2012, Afternoon, race 5 post #8. Result: 4-3-5- . SLATEX EMERALD, Bluffs Run, 05/20/2012, Afternoon, race 6 post #1. Result: 8-2-3- . TWISTING TWISTER, Bluffs Run, 05/20/2012, Afternoon, race 11 post #8. Result: 6-7-1- . BOC'S DOUBLEDOSE, Dubuque, 05/20/2012, Afternoon, race 14 post #7. Result: 1-4-6- . DLT EXTRACTOR, Gulf Greyhound, 05/20/2012, Afternoon, race 13 post #8. Result: 2-8-5- . CTW CHICK MAGNET, Birmingham, 05/19/2012, Afternoon, race 2 post #4. Result: 1-7-4- . JET FORCE, Bluffs Run, 05/19/2012, Afternoon, race 8 post #4. Result: 4-1-3- . MC FULL MOON, Bluffs Run, 05/19/2012, Afternoon, race 10 post #2. Result: 6-5-2- . SLATEX TOPAZ, Bluffs Run, 05/19/2012, Afternoon, race 11 post #5. Result: 7-3-1- . DOUG'S FREIDA, Gulf Greyhound, 05/19/2012, Afternoon, race 13 post #1. Result: 5-6-1- . WP'S CLINTON, Orange Park, 05/19/2012, Afternoon, race 11 post #6. Result: 5-7-6- . MAGIC TEMPURA, Orange Park, 05/19/2012, Evening, race 13 post #5. Result: 5-6-7- . JUMP N JIVE, Bluffs Run, 05/20/2012, Afternoon, race 5, post #8. SLATEX EMERALD, Bluffs Run, 05/20/2012, Afternoon, race 6, post #1. TWISTING TWISTER, Bluffs Run, 05/20/2012, Afternoon, race 11, post #8. BOC'S DOUBLEDOSE, Dubuque, 05/20/2012, Afternoon, race 14, post #7. DLT EXTRACTOR, Gulf Greyhound, 05/20/2012, Afternoon, race 13, post #8. COACH PRINCESS, Birmingham, 05/18/2012, Evening, race 11 post #8. Result: 4-8-3- . LAVA MATSUI, Birmingham, 05/18/2012, Evening, race 11 post #7. Result: 4-8-3- . SNEAKY PEEKY, Ebro, 05/18/2012, Evening, race 8 post #1. WW'S GUCCI, Orange Park, 05/18/2012, Evening, race 9 post #6. Result: 5-1-8- . AMF SULTANA, Palm Beach, 05/18/2012, Afternoon, race 12 post #5. Result: 4-1-2- . TROUGELZ, Southland, 05/18/2012, Evening, race 18 post #2. Result: 2-3-8- . CTW CHICK MAGNET, Birmingham, 05/19/2012, Afternoon, race 2, post #4. JET FORCE, Bluffs Run, 05/19/2012, Afternoon, race 8, post #4. MC FULL MOON, Bluffs Run, 05/19/2012, Afternoon, race 10, post #2. SLATEX TOPAZ, Bluffs Run, 05/19/2012, Afternoon, race 11, post #5. DOUG'S FREIDA, Gulf Greyhound, 05/19/2012, Afternoon, race 13, post #1. WP'S CLINTON, Orange Park, 05/19/2012, Afternoon, race 11, post #6. MAGIC TEMPURA, Orange Park, 05/19/2012, Evening, race 13, post #5. COACH PRINCESS, Birmingham, 05/18/2012, Evening, race 11, post #8. LAVA MATSUI, Birmingham, 05/18/2012, Evening, race 11, post #7. SNEAKY PEEKY, Ebro, 05/18/2012, Evening, race 8, post #1. WW'S GUCCI, Orange Park, 05/18/2012, Evening, race 9, post #6. AMF SULTANA, Palm Beach, 05/18/2012, Afternoon, race 12, post #5. TROUGELZ, Southland, 05/18/2012, Evening, race 18, post #2. MANIC MAC ELROY, Tri-State, 05/18/2012, Evening, race 3, post #6. UMR HYDRO, Tri-State, 05/18/2012, Evening, race 11, post #3. RAMS KIZZY KATE, Tucson, 05/18/2012, Evening, race 5, post #6. RED PERSISTENCE, Tucson, 05/18/2012, Evening, race 11, post #4. BELLA KAYAKER, Wheeling, 05/18/2012, Afternoon, race 11, post #5. KB'S RUCKUS, Wheeling, 05/18/2012, Afternoon, race 16, post #4. FLYING LAHINCH, Wheeling, 05/18/2012, Evening, race 3, post #8. BLACKJACK BEAVER, Wheeling, 05/18/2012, Evening, race 7, post #2. FLYING HABANERO, Wheeling, 05/18/2012, Evening, race 14, post #4. BOC'S DOUBLEDOSE, Dubuque, 05/17/2012, Evening, race 13 post #5. Result: 2-7-4- . KIOWA VANESSA, Orange Park, 05/17/2012, Evening, race 11 post #4. Result: 8-5-6- . JUST TERRIFIC, Palm Beach, 05/17/2012, Afternoon, race 8 post #5. Result: 3-7-8- . BACS XTREME, Palm Beach, 05/17/2012, Afternoon, race 11 post #5. Result: 2-4-3- . UHAUL MUFFIN, Palm Beach, 05/17/2012, Afternoon, race 12 post #8. Result: 8-3-1- . BACKWOOD CODY, Derby Lane, 05/17/2012, Evening, race 6 post #2. Result: 2-6-5- . CRAIGIE I AM JAK, Derby Lane, 05/17/2012, Evening, race 8 post #1. Result: 2-3-7- . GABLE EDDIE, Derby Lane, 05/17/2012, Evening, race 10 post #6. Result: 4-6-3- . VENUS ESPINOSA, Derby Lane, 05/17/2012, Evening, race 10 post #1. Result: 4-6-3- . MANI STRONG, Tri-State, 05/17/2012, Evening, race 12 post #4. Result: 2-5-1- . MAGIC TORPEDO, Tri-State, 05/17/2012, Evening, race 15 post #8. Result: 4-1-6- . GAME PLANE, Tucson, 05/17/2012, Evening, race 7 post #8. Result: 8-1-3- . OUT D BOX, Tucson, 05/17/2012, Evening, race 9 post #7. Result: 5-4-1- . BOC'S DOUBLEDOSE, Dubuque, 05/17/2012, Evening, race 13, post #5. KIOWA VANESSA, Orange Park, 05/17/2012, Evening, race 11, post #4. JUST TERRIFIC, Palm Beach, 05/17/2012, Afternoon, race 8, post #5. BACS XTREME, Palm Beach, 05/17/2012, Afternoon, race 11, post #5. UHAUL MUFFIN, Palm Beach, 05/17/2012, Afternoon, race 12, post #8. BACKWOOD CODY, Derby Lane, 05/17/2012, Evening, race 6, post #2. CRAIGIE I AM JAK, Derby Lane, 05/17/2012, Evening, race 8, post #1. GABLE EDDIE, Derby Lane, 05/17/2012, Evening, race 10, post #6. VENUS ESPINOSA, Derby Lane, 05/17/2012, Evening, race 10, post #1. MANI STRONG, Tri-State, 05/17/2012, Evening, race 12, post #4. MAGIC TORPEDO, Tri-State, 05/17/2012, Evening, race 15, post #8. GAME PLANE, Tucson, 05/17/2012, Evening, race 7, post #8. OUT D BOX, Tucson, 05/17/2012, Evening, race 9, post #7. COACH PRINCESS, Birmingham, 05/16/2012, Afternoon, race 14 post #1. Result: 1-7-2- . TWISTING TWISTER, Bluffs Run, 05/16/2012, Afternoon, race 10 post #7. Result: 6-5-1- . DLT EXTRACTOR, Gulf Greyhound, 05/16/2012, Afternoon, race 2 post #4. Result: 4-6-8- . DOUG'S FREIDA, Gulf Greyhound, 05/16/2012, Afternoon, race 11 post #4. Result: 7-2-1- . MAGIC TEMPURA, Orange Park, 05/16/2012, Evening, race 2 post #8. Result: 5-1-7- . KCK CANDIBAR, Palm Beach, 05/16/2012, Afternoon, race 4 post #8. Result: 1-8-7- . CRS SPIDER WEB, Palm Beach, 05/16/2012, Afternoon, race 11 post #3. Result: 6-2-3- . KB'S HASLET, Palm Beach, 05/16/2012, Afternoon, race 14 post #1. Result: 1-4-7-2. SAND CLOUD, Derby Lane, 05/16/2012, Afternoon, race 10 post #6. Result: 1-3-2- . JW TITLEIST, Derby Lane, 05/16/2012, Evening, race 11 post #1. Result: 5-8-1- . PALM BEACH KENNEL CLUB PRESS CONFERENCE FOR FIRST-EVER $10k ROONEY'S OLD IRISH ALE CUP RACES THURSDAY, MAY 24! COACH PRINCESS, Birmingham, 05/16/2012, Afternoon, race 14, post #1. TWISTING TWISTER, Bluffs Run, 05/16/2012, Afternoon, race 10, post #7. DLT EXTRACTOR, Gulf Greyhound, 05/16/2012, Afternoon, race 2, post #4. DOUG'S FREIDA, Gulf Greyhound, 05/16/2012, Afternoon, race 11, post #4. MAGIC TEMPURA, Orange Park, 05/16/2012, Evening, race 2, post #8. KCK CANDIBAR, Palm Beach, 05/16/2012, Afternoon, race 4, post #8. CRS SPIDER WEB, Palm Beach, 05/16/2012, Afternoon, race 11, post #3. KB'S HASLET, Palm Beach, 05/16/2012, Afternoon, race 14, post #1. SAND CLOUD, Derby Lane, 05/16/2012, Afternoon, race 10, post #6. JW TITLEIST, Derby Lane, 05/16/2012, Evening, race 11, post #1. LAVA MATSUI, Birmingham, 05/15/2012, Evening, race 7 post #5. Result: 8-5-7- . CTW CHICK MAGNET, Birmingham, 05/15/2012, Evening, race 10 post #5. Result: 1-2-3- . MC FULL MOON, Bluffs Run, 05/15/2012, Afternoon, race 2 post #2. Result: 3-6-7- . STARZ EQUALMIST, Palm Beach, 05/15/2012, Afternoon, race 10 post #7. Result: 7-2-8- . RAMS KIZZY KATE, Tucson, 05/15/2012, Evening, race 12 post #5. Result: 7-5-1- . RED PERSISTENCE, Tucson, 05/15/2012, Evening, race 12 post #2. Result: 7-5-1- . WW'S RISKY RIDER, Wheeling, 05/15/2012, Afternoon, race 11 post #3. Result: 1-5-8- . 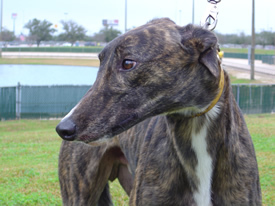 Since the beginning of March of 2012, this week’s recipient of the Greyhound of the Week honors, Kells Wild Bill of Libby Racing Kennels, has dominated the 550-yard racing scene. The 69-pound white ticked black male bred from TK Quick Strike and Gilded Memory* is quickly climbing up the wins list for this year with a record of 22/11-2-2-2 and showing no signs up letting up at all. During this impressive `hot streak`, Kells Wild Bill has been victorious in nine of his last twelve races including eight grade AA wins. Kells Wild Bill also tends to put win strings together in bunches with a two-race streak that began this joyride on March 4. Then a four-race undefeated streak winning each start by at least five lengths followed after being bumped out of contention on March 14. Two narrow one-length defeats finishing third and second respectively now leads to the current three-race winning streak to earn this latest recognition. It will be difficult to wipe the smiles off the faces of kennel owner Kenneth Biehle and trainer Cindy Unrein as Gulf Greyhound Park’s top kennel, K-Rod Kennel, earns the Kennel of the Week honors for the third consecutive week. With 63 starts, K-Rod Kennel had 11 wins, 10 seconds, 8 thirds and 5 fourth place finishes earning $8,624.50 in purse money edging out D.Q. Williams Kennel by $477. Leading the way was KB’s Rayburn with a grade AA win on Sunday May 6. LAVA MATSUI, Birmingham, 05/15/2012, Evening, race 7, post #5. CTW CHICK MAGNET, Birmingham, 05/15/2012, Evening, race 10, post #5. MC FULL MOON, Bluffs Run, 05/15/2012, Afternoon, race 2, post #2. STARZ EQUALMIST, Palm Beach, 05/15/2012, Afternoon, race 10, post #7. RAMS KIZZY KATE, Tucson, 05/15/2012, Evening, race 12, post #5. RED PERSISTENCE, Tucson, 05/15/2012, Evening, race 12, post #2. WW'S RISKY RIDER, Wheeling, 05/15/2012, Afternoon, race 11, post #3. COACH PRINCESS, Birmingham, 05/14/2012, Afternoon, race 10 post #2. Result: 6-2-7- . MONKEYS UNCLE, Palm Beach, 05/14/2012, Afternoon, race 10 post #7. Result: 1-8-7- . MISTIE BASS, Southland, 05/14/2012, T, race 20 post #3. BORN FREE, Sanford Orlando, 05/14/2012, Afternoon, race 6 post #5. Result: 1-4-6- . OUT D BOX, Tucson, 05/14/2012, Evening, race 6 post #7. Result: 3-4-2- . JUMP N JIVE, Bluffs Run, 05/13/2012, Afternoon, race 2 post #5. Result: 3-1-5- . JET FORCE, Bluffs Run, 05/13/2012, Afternoon, race 7 post #2. Result: 5-2-1- . SLATEX TOPAZ, Bluffs Run, 05/13/2012, Afternoon, race 10 post #3. Result: 2-6-1- . WP'S CLINTON, Orange Park, 05/13/2012, Afternoon, race 11 post #8. Result: 1-8-2- . COACH PRINCESS, Birmingham, 05/14/2012, Afternoon, race 10, post #2. MONKEYS UNCLE, Palm Beach, 05/14/2012, Afternoon, race 10, post #7. MISTIE BASS, Southland, 05/14/2012, T, race 20, post #3. BORN FREE, Sanford Orlando, 05/14/2012, Afternoon, race 6, post #5. OUT D BOX, Tucson, 05/14/2012, Evening, race 6, post #7. CTW CHICK MAGNET, Birmingham, 05/12/2012, Afternoon, race 7 post #6. Result: 7-1-5- . FM SAPPHIRE, Birmingham, 05/12/2012, Evening, race 7 post #7. Result: 2-3-5- . BOC'S DOUBLEDOSE, Dubuque, 05/12/2012, Afternoon, race 14 post #3. Result: 4-3-5- . KIOWA VANESSA, Orange Park, 05/12/2012, Evening, race 4 post #7. Result: 7-4-5- . WW'S GUCCI, Orange Park, 05/12/2012, Evening, race 5 post #8. Result: 8-1-6- . BACS XTREME, Palm Beach, 05/12/2012, Afternoon, race 11 post #2. Result: 3-7-2- . JUST TERRIFIC, Palm Beach, 05/12/2012, Afternoon, race 12 post #7. Result: 4-5-6- . JUMP N JIVE, Bluffs Run, 05/13/2012, Afternoon, race 2, post #5. JET FORCE, Bluffs Run, 05/13/2012, Afternoon, race 7, post #2. SLATEX TOPAZ, Bluffs Run, 05/13/2012, Afternoon, race 10, post #3. WP'S CLINTON, Orange Park, 05/13/2012, Afternoon, race 11, post #8. COACH PRINCESS, Birmingham, 05/11/2012, Evening, race 9 post #4. Result: 5-4-2- . LAVA MATSUI, Birmingham, 05/11/2012, Evening, race 9 post #5. Result: 5-4-2- . TWISTING TWISTER, Bluffs Run, 05/11/2012, Afternoon, race 7 post #8. Result: 2-5-3- . DLT EXTRACTOR, Gulf Greyhound, 05/11/2012, Evening, race 2 post #8. Result: 1-7-8- . DOUG'S FREIDA, Gulf Greyhound, 05/11/2012, Evening, race 11 post #6. Result: 7-2-1- . MAGIC TEMPURA, Orange Park, 05/11/2012, Evening, race 2 post #3. Result: 2-4-8- . CTW CHICK MAGNET, Birmingham, 05/12/2012, Afternoon, race 7, post #6. FM SAPPHIRE, Birmingham, 05/12/2012, Evening, race 7, post #7. BOC'S DOUBLEDOSE, Dubuque, 05/12/2012, Afternoon, race 14, post #3. KIOWA VANESSA, Orange Park, 05/12/2012, Evening, race 4, post #7. WW'S GUCCI, Orange Park, 05/12/2012, Evening, race 5, post #8. BACS XTREME, Palm Beach, 05/12/2012, Afternoon, race 11, post #2. JUST TERRIFIC, Palm Beach, 05/12/2012, Afternoon, race 12, post #7. COACH PRINCESS, Birmingham, 05/11/2012, Evening, race 9, post #4. LAVA MATSUI, Birmingham, 05/11/2012, Evening, race 9, post #5. TWISTING TWISTER, Bluffs Run, 05/11/2012, Afternoon, race 7, post #8. DLT EXTRACTOR, Gulf Greyhound, 05/11/2012, Evening, race 2, post #8. DOUG'S FREIDA, Gulf Greyhound, 05/11/2012, Evening, race 11, post #6. MAGIC TEMPURA, Orange Park, 05/11/2012, Evening, race 2, post #3. CRS SPIDER WEB, Palm Beach, 05/11/2012, Afternoon, race 11, post #5. KB'S HASLET, Palm Beach, 05/11/2012, Evening, race 13, post #6. KCK CANDIBAR, Palm Beach, 05/10/2012, Afternoon, race 4 post #5. Result: 1-4-2- . MISTIE BASS, Southland, 05/10/2012, Evening, race 15 post #6. Result: 6-2-4- . OUT D BOX, Tucson, 05/10/2012, Evening, race 5 post #1. Result: 1-3-2- . KCK CANDIBAR, Palm Beach, 05/10/2012, Afternoon, race 4, post #5. MISTIE BASS, Southland, 05/10/2012, Evening, race 15, post #6. OUT D BOX, Tucson, 05/10/2012, Evening, race 5, post #1. COACH PRINCESS, Birmingham, 05/09/2012, Afternoon, race 6 post #4. Result: 2-3-5- . CTW CHICK MAGNET, Birmingham, 05/09/2012, Evening, race 8 post #1. Result: 7-4-6- . FM SAPPHIRE, Birmingham, 05/09/2012, Evening, race 11 post #1. Result: 7-2-6- . SLATEX TOPAZ, Bluffs Run, 05/09/2012, Afternoon, race 6 post #4. Result: 5-4-7- . MC FULL MOON, Bluffs Run, 05/09/2012, Afternoon, race 10 post #1. Result: 2-5-8- . KIOWA VANESSA, Orange Park, 05/09/2012, Afternoon, race 9 post #8. Result: 3-1-8- . MONKEYS UNCLE, Palm Beach, 05/09/2012, Afternoon, race 12 post #4. Result: 7-4-3- . STARZ EQUALMIST, Palm Beach, 05/09/2012, Afternoon, race 15 post #8. Result: 3-1-8- . SAND CLOUD, Derby Lane, 05/09/2012, Afternoon, race 10 post #5. Result: 1-7-4- . BACKWOOD CODY, Derby Lane, 05/09/2012, Evening, race 9 post #6. Result: 8-6-4- . MANIC MAC ELROY, Tri-State, 05/09/2012, Evening, race 11 post #7. Result: 3-1-8- . GAME PLANE, Tucson, 05/09/2012, Evening, race 12 post #7. Result: 5-7-3- . WW'S RISKY RIDER, Wheeling, 05/09/2012, Afternoon, race 12 post #5. Result: 1-3-4- . COACH PRINCESS, Birmingham, 05/09/2012, Afternoon, race 6, post #4. CTW CHICK MAGNET, Birmingham, 05/09/2012, Evening, race 8, post #1. FM SAPPHIRE, Birmingham, 05/09/2012, Evening, race 11, post #1. SLATEX TOPAZ, Bluffs Run, 05/09/2012, Afternoon, race 6, post #4. MC FULL MOON, Bluffs Run, 05/09/2012, Afternoon, race 10, post #1. KIOWA VANESSA, Orange Park, 05/09/2012, Afternoon, race 9, post #8. MONKEYS UNCLE, Palm Beach, 05/09/2012, Afternoon, race 12, post #4. STARZ EQUALMIST, Palm Beach, 05/09/2012, Afternoon, race 15, post #8. SAND CLOUD, Derby Lane, 05/09/2012, Afternoon, race 10, post #5. BACKWOOD CODY, Derby Lane, 05/09/2012, Evening, race 9, post #6. MANIC MAC ELROY, Tri-State, 05/09/2012, Evening, race 11, post #7. GAME PLANE, Tucson, 05/09/2012, Evening, race 12, post #7. WW'S RISKY RIDER, Wheeling, 05/09/2012, Afternoon, race 12, post #5. LAVA MATSUI, Birmingham, 05/08/2012, Evening, race 8 post #3. Result: 3-1-4- . UHAUL MUFFIN, Palm Beach, 05/08/2012, Afternoon, race 14 post #4. Result: 4-8-7- . AMF SULTANA, Palm Beach, 05/08/2012, Afternoon, race 15 post #4. Result: 4-7-5- . VENUS ESPINOSA, Derby Lane, 05/08/2012, Evening, race 3 post #6. Result: 6-4-2- . GABLE EDDIE, Derby Lane, 05/08/2012, Evening, race 6 post #3. Result: 5-3-6- . RAMS KIZZY KATE, Tucson, 05/08/2012, Evening, race 3 post #1. Result: 1-3-4- . RED PERSISTENCE, Tucson, 05/08/2012, Evening, race 9 post #5. Result: 5-4-7- . BELLA KAYAKER, Wheeling, 05/08/2012, Afternoon, race 5 post #3. Result: 3-8-1- . Returning to the Greyhound of the Week spotlight after earning the honors just two months ago is Spry Derosa from K-Rod Kennel. The 59-pound red female bred from Dodgem by Design and Dancer Drive has shown historically throughout her impressive career of stringing multiple victories together. In December of 2011 and February of 2012, there were two separate three win a row streaks and another four race winning streak during the month of March. With her latest two front running efforts, Spry Derosa appears to be on another roll. Let us look at the performance on the afternoon of Sunday April 29. Heading into the race, Spry Derosa was experiencing difficult times going winless in three consecutive starts including falling down in her previous outing. Despite all of this, the fans made Spry Derosa the 4/5 race favorite starting from the #7 post position. Here comes Marquey and out popped Spry Derosa with the candy-striped #7 blanket to seize the lead. As some would say, `the rest is history`, and it was with Spry Derosa running away from the grade AA competition to win by 10 lengths in the second fastest time of her career at 29.74 seconds. Make it two weeks in a row for K-Rod Kennel and trainer Cindy Unrein earning the Kennel of the Week honors. Gulf Greyhound Park’s top kennel in 2012 solidified their lead with a week comprised of 11 wins, 6 seconds, 6 thirds and 11 fourth place finishes out of their 60 starts earning $9,321.90 in purse money. Leading the way with two top grade victories was this week’s Greyhound of the Week, Spry Derosa. MAGIC TEMPURA, Orange Park, 05/07/2012, Evening, race 2 post #7. Result: 5-2-7- . WW'S GUCCI, Orange Park, 05/07/2012, Evening, race 14 post #8. Result: 1-3-6- . JUST TERRIFIC, Palm Beach, 05/07/2012, Afternoon, race 12 post #3. Result: 5-8-7- . AMF EX PRESIDENT, Southland, 05/07/2012, T, race 11 post #8. JW TITLEIST, Derby Lane, 05/07/2012, Evening, race 10 post #8. Result: 5-3-2- . UMR HYDRO, Tri-State, 05/07/2012, Evening, race 6 post #3. Result: 1-3-4- . LAVA MATSUI, Birmingham, 05/08/2012, Evening, race 8, post #3. UHAUL MUFFIN, Palm Beach, 05/08/2012, Afternoon, race 14, post #4. AMF SULTANA, Palm Beach, 05/08/2012, Afternoon, race 15, post #4. VENUS ESPINOSA, Derby Lane, 05/08/2012, Evening, race 3, post #6. GABLE EDDIE, Derby Lane, 05/08/2012, Evening, race 6, post #3. RAMS KIZZY KATE, Tucson, 05/08/2012, Evening, race 3, post #1. RED PERSISTENCE, Tucson, 05/08/2012, Evening, race 9, post #5. BELLA KAYAKER, Wheeling, 05/08/2012, Afternoon, race 5, post #3. MAGIC TEMPURA, Orange Park, 05/07/2012, Evening, race 2, post #7. WW'S GUCCI, Orange Park, 05/07/2012, Evening, race 14, post #8. JUST TERRIFIC, Palm Beach, 05/07/2012, Afternoon, race 12, post #3. AMF EX PRESIDENT, Southland, 05/07/2012, T, race 11, post #8. JW TITLEIST, Derby Lane, 05/07/2012, Evening, race 10, post #8. UMR HYDRO, Tri-State, 05/07/2012, Evening, race 6, post #3. BOC'S DOUBLEDOSE, Dubuque, 05/06/2012, Afternoon, race 8 post #5. Result: 1-4-7- . CRS SPIDER WEB, Palm Beach, 05/06/2012, Afternoon, race 7 post #8. Result: 6-5-7- . BACS XTREME, Palm Beach, 05/06/2012, Afternoon, race 9 post #1. Result: 8-6-7- . COACH PRINCESS, Birmingham, 05/05/2012, Evening, race 8 post #8. Result: 8-4-3- . FM SAPPHIRE, Birmingham, 05/05/2012, Evening, race 9 post #4. Result: 1-6-3- . TWISTING TWISTER, Bluffs Run, 05/05/2012, Afternoon, race 10 post #6. Result: 7-3-6- . JUMP N JIVE, Bluffs Run, 05/05/2012, Afternoon, race 11 post #2. Result: 3-5-6- . DLT EXTRACTOR, Gulf Greyhound, 05/05/2012, Afternoon, race 9 post #2. Result: 3-4-2- . MONKEYS UNCLE, Palm Beach, 05/05/2012, Afternoon, race 10 post #5. Result: 7-2-3- . BOC'S DOUBLEDOSE, Dubuque, 05/06/2012, Afternoon, race 8, post #5. CRS SPIDER WEB, Palm Beach, 05/06/2012, Afternoon, race 7, post #8. BACS XTREME, Palm Beach, 05/06/2012, Afternoon, race 9, post #1.